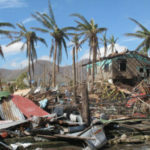 To study the strength of Hurricane Yolanda, team members Andrew Kennedy and Shenen Chen traveled to Guiuan, Eastern Samar, to measure the rock movements. Because of the tidal waves, many large boulders have been deposited on the beach. Two Philippine Institute of Civil Engineers members, Emelyn D. Amigo and Nessy Jade P. Geroy, both engineers from the regional Department of Public Works and Highways, joined us in the study. With their help, we measured the size of several boulders and took pictures with a GPS camera to identify the rock locations. Guiuan is a rural town and the first landing point of Yolanda. Again, we saw several collapsed structures and tents donated for displaced people. Trying to find a hotel was a real challenge because of the influx of United Nations volunteers and helpers from other nations. We managed to find a hotel a two-hour drive away (rough roads). It rained in the morning and we were concerned that we might not get any work done. But it finally stopped raining and we ended up with a very productive day. On our last day in the disaster area, we drove around and looked at the damaged structures in Guiuan including the police station, municipal hall, regional office of Department of Public Works and Highways, public market places and bus stations. All of the inspected structures sustained severe wind damage. We drove by a bridge and saw kids swimming in the water and diving off the bridge. It is refreshing to see children laughing and having fun. A testimony that the local people are rebounding from the disaster. We rushed to the Tacloban airport to catch our flight home and so we did not have time to have lunch. But we gave a quick farewell to all of our friends. We did not have time to shop for souvenirs but managed to buy a few can openers that said “Tindog Tacloban,” which translates as “Rise up Tacloban.” We certainly echo the message and hope the people who survived the disaster can overcome and prosper. 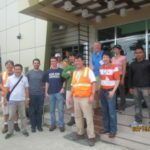 Saturday, May 3, a team of seven civil engineers from ASCE’s Technical Council on Forensic Engineering, in cooperation with the Technical Council on Wind Engineering, left for the Philippines on a week-long mission to conduct post-disaster assessments, documenting evidence of structural and geo-system damage to historic and residential structures and public infrastructure. Today, Shenen Chen, Ph.D., P.E., M.ASCE, professor at the University of North Carolina – Charlotte, and chair of ASCE’s TCFE Committee on Forensic Investigations, chronicled the team’s experiences in this exclusive daily report for ASCE. This is the seventh and final installment in the series. interesting to learn forensic engineering and damage assessment . appreciate if there is a proper final report available to state causes of the damages ,disaster and recommendation to minimise such effect . for reference . also ,ASCE guides on disaster /damage assessment and forensic study .